'Lazaretto' is the second studio album by Jack White and while the CD release has been selling well, it's the newly arrived vinyl 'ULTRA' LP which is making all the noise in store. It was released recently through White's own label Third Man Records in association with XL Recordings and Columbia Records. The limited-edition "Ultra" LP features hidden songs, secret grooves, and holograms of angels that materialise when the record is being played. Play on one side from the outside into centre - the flip side from the centre to the outside!! This album has it all !! Lazaretto was partly inspired by a collection of short stories, poems, and plays White wrote when he was 19 years old and rediscovered years later in his attic. 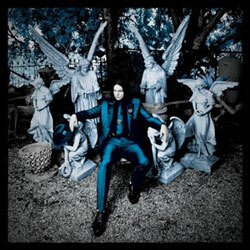 Lazaretto debuted at number one on the Billboard 200, selling 138,000 copies in its first week.